Mission and Identity hosts events that reinforce the community's commitment to the University mission. Each year the various offices that make up the Division of Mission and Identity host events and programs that bring the mission to life on and off campus for the Duquesne community. Founders Week is an annual University-wide celebration to honor the legacy, vision and values of Duquesne's Spiritan founders. Held in early February, the event features activities focused around Spiritan education, the University's mission and how the University community lives that mission each day. The Cross-Cultural Mission Experience (CCME) is a fully immersive, week-long program during which participating students spend their spring breaks doing service in a community in need. Over the years, Duquesne has built local relationships through annual trips to Immokalee, FL, New Orleans, LA, and the Appalachia region of West Virginia. Students live and work in the communities to gain as complete an understanding of the people and places whom they are helping as possible. The Monsignor Rice Lecture Series moves participants from rooms where they discuss issues to the very places these issues can be seen and felt. The series offers four community excursions, featuring mobile panels and on-site conversation with community leaders, residents, entrepreneurs, legislators, faculty, and students. Each excursion focuses on a particular theme and brings to life the role of community-engaged scholarship in a Spiritan context to encourage awareness, education, and responsible action for justice. Every June, Collegium, a national organization of Catholic colleges and universities, sponsors a summer colloquy - part workshop, part retreat - for faculty from its member institutions and advanced graduate students from universities throughout the United States. The colloquies invite scholars to explore compelling aspects of the Catholic Intellectual Tradition, and to develop their own sense of vocation as intellectuals in a contemporary context. Spring Clean-Up is an opportunity each year to renew and strengthen Duquesne's longstanding relationship with the local community. Students, faculty and staff work with on-campus and community partners to do clean-up projects in Pittsburgh's Hill District and South Side neighborhoods such as litter removal, green space planting, and graffiti removal. This series of informal receptions explores the themes and ideas conveyed through Catholic art. Catholic Artistic Imagination is an opportunity to share beautiful works of art with interesting people, showcase the artistic and intellectual expertise and gifts of Duquesne faculty, graduate students and staff, and foster a broad and inclusive understanding of Catholic intellectual tradition. 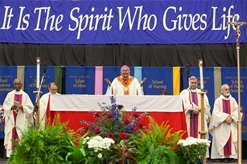 The Mass of the Holy Spirit is the traditional opening of the academic year to pray for God's guidance and protection in the coming school year. People of all faiths are welcome. In October, Duquesne hosts a luncheon to celebrate National Disability Employment Awareness Month. The community gathers to honor the many and varied contributions of the University's and the nation's workers with disabilities. The Division of Mission and Identity invites representatives from the Univeristy and the Pittsburgh area to speak on this topic, and to recognize progress and programs to promote opportunity for the disabled in the areas around Duquesne.